The noise on social media is not getting any quieter, so brands should be focusing their efforts on rising above the noise in order to ensure consumers can hear what they have to say. 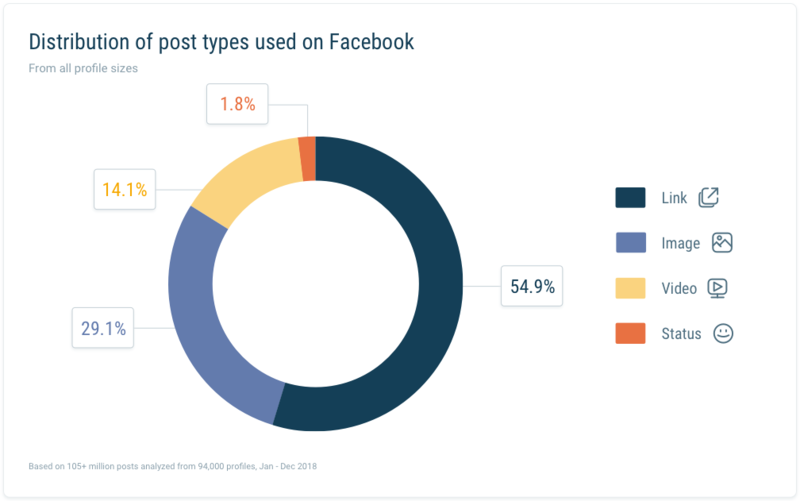 Quintly gathered data from over 94,000 Facebook pages and over 105 million posts from 2018, to present brands with the facts surrounding Facebook engagement. Video receives 65% more interactions than images and 72% more interactions than link posts. 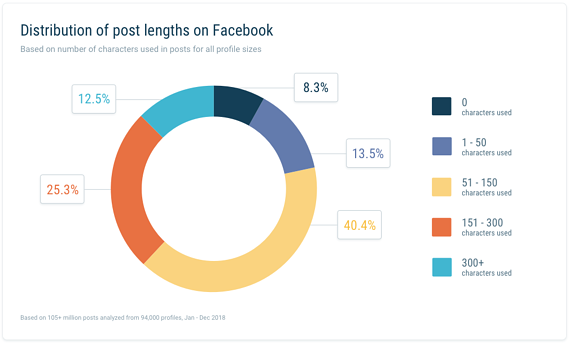 The largest share of post lengths on Facebook are captions with 51-150 characters, roughly the same length as a Tweet. Quintly, a social analytics platform, created a Facebook study report which analyses the performance of numerous Facebook profiles. The data gathered was created by analysing over 94,000 Facebook pages and over 105 million posts from 2018. 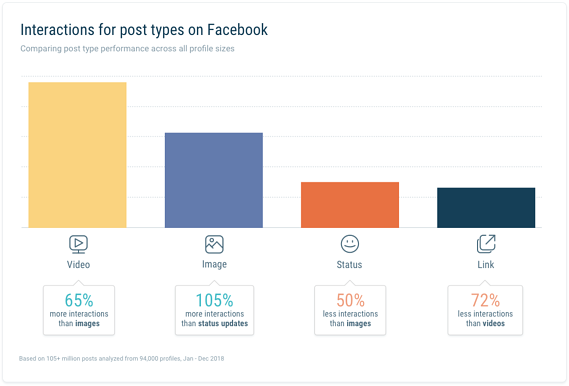 This data will help brands get a better idea of what is and is not working on Facebook and as a result, tailor their content distribution strategy to work in line with these findings. When considering the current social media climate and the difficulty brands are encountering when trying to engage the tougher demographics, like Gen Z, it should come as no surprise that video posts generate the most engagement, yet businesses are set on focusing their content around link posts. 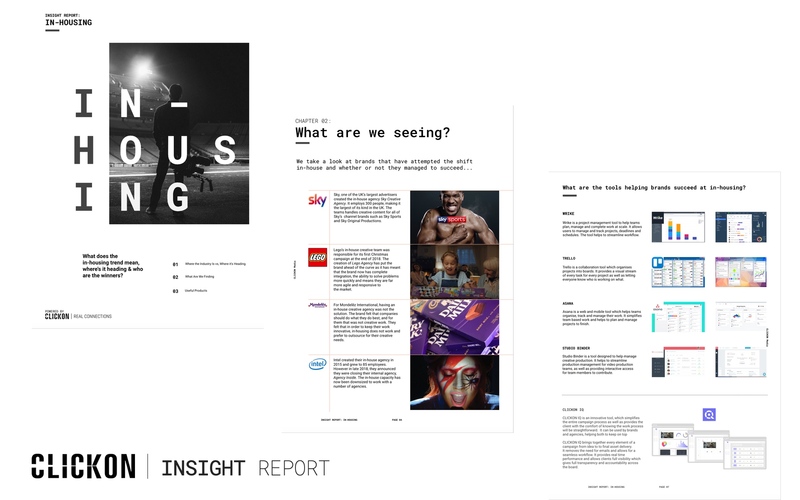 Out of the 105 million analysed posts, 55% were link posts, 29% were photos, and 14% were videos. It goes without saying that the type of business behind the brand will affect what form of content is posted, and generally speaking, businesses share more link focused posts because their aim is to drive content back to their own sites. Video content will take longer to create, especially if you consider regular distribution at the highest quality, but as demonstrated in the graph below, video receives the highest level of engagement out of all forms of content. It receives 72% more interactions than link based posts, which is shocking when there are 40% more link posts distributed on Facebook than video posts. Without a doubt, if video content is appropriate to your business and you have the resources to create them, they should be your main focus for content. Otherwise, next on your list should be images. Although driving traffic is usually the main aim for businesses on Facebook, in order to see an increase in interaction within your respective communities, you need to mix up your strategy. This will lead to greater reach in future posts which will ensure your page has a better overall performance. Whilst the type of content you post is crucial to engagement levels, as outlined in our article ‘When is the best time to post on social media’, Quintly rightly investigated posting on weekdays versus weekends. In general, people will have more free time on weekends, as they are taken away from the hustle and bustle of the working day - there is more time to scroll through social media, resulting in less competition for your ads - there is less need to fight for consumer attention. It is worth, in addition to your normal weekday posts, trialling weekend posts to see how the engagement levels differ. When comparing other social media platforms to Facebook, you need to consider what makes each platform successful. For example with Instagram, it is a highly visual platform, so in general, the picture or video you post is going to be a more focal point than the caption. Whereas Twitter is a great platform to listen into social conversations, and with the limit to 140 characters per tweet, this makes it far easier for users to tap into. This attribute is evident in the graph above, posts with 51-150 characters represent the highest share in the data at 40%, with 151-300 following with 25%. Consumers have less patience to read information they do not believe is applicable to them, so brands are better off striking their consumers with incredible visual content that will lead to higher engagement. Hook your consumers via this method first, and once they are interested and invested in your brand, it will be easier to feed more information that is relevant to them.